This week’s Secret Ingredient for Friday Foodie Fix is Scallops. Scallops are classified into two broad groups, the small Bay Scallops and the larger Sea Scallops. Bay scallops are generally found on the east coast. They are around 1/2 inch in diameter and average 100 per pound. Their meat is sweeter than that of a sea scallop. If you are on the west coast you may find calico scallops. The sea scallop averages 1 1/2 inches in diameter and around 30 per pound. Now you may have heard of diver scallops. That just refers to the ones that are hand-picked by divers instead of being harvested by trawling boats. They cost more and usually their shells are better looking. The color of scallops range from pale beige to creamy pink. If you find ones that are stark white, they may have been soaked in water to increase their weight. Fall is the peak season for bay scallops on the east coast and midfall to midspring for sea scallops. When you purchase yours make sure to get them right into the refrigerator and use them in a day or two. Now it’s your turn to share your original recipes using scallops. Use Mr. Linky or the comments section. Please link back to your original blog post and share the link love. 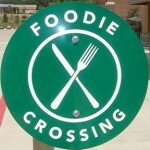 Review the Friday Foodie Fix page for all the rules. PLEASE only submit recipes with the Secret Ingredient. If you have a recipe from a previous week’s ingredient please go to the main Friday Foodie Fix page above and click on that ingredient. You will be taken to that page and you can still add in recipes. Next week’s Secret Ingredient is ……………..Agave! I haven't bought scallops lately, but you have gotten me in the mood for them again. I'm looking forward to seeing next week's recipes with agave. Linda- Thanks for sharing. Scallops can be a romantic meal! I hope I followed the rules for the link up correctly. My recipe for Spicy Pinto Beans is Vegetarian and Vegan (if you omit cheese from the final burrito product), GF and CF. It has a few of the "secret ingredients" in it. At the bottom of the post are instructions (easy-peasy) for making chipotle chili puree, which is great in all sorts of recipes. Enjoy! Happy to find you through Kitchen Kop's site. Melodie- Thanks for sharing. There is only one secret ingredient each week and the recipe must have that ingredient. I moved yours to the week with Beans. You can always go back and enter in your recipes for past weeks, just make sure they have that week's ingredient in the recipe shared. The lemon scallops dish sounds so good! Going to look at your scallops recipes and the others … hope you're more dug out now. (Don't even talk about this Alberta clipper coming.) Still in catch-up mode here for everything. Mr. GFE is digging his mom out with his siblings today. She had 6-ft drifts in her almost one-mile long driveway. Shirley- Looks like not many folks cook with scallops. And I disagree that bacon wrapped scallops not being a recipe. Anytime you put two things together, it's a recipe! Mostly dug out except my poor little VW bug is buried. Might not see it til spring.